The Bus Rapid Transit (BRT) has been officially put into operation on the Kim Ma – Yen Nghia route in Hanoi, starting December 31. Scene at the ceremony launching the BRT system in Hanoi. With prioritised traffic lights and lanes, the buses run through Giang Vo, Lang Ha, Le Van Luong, Le Trong Tan, Tran Phu and Ba La streets. 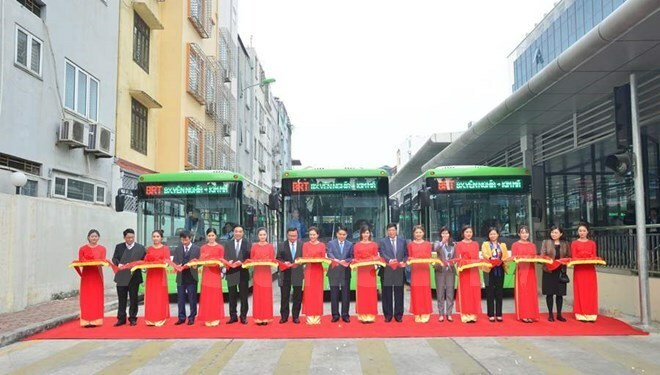 After the launching ceremony, Hanoi leaders got on a rapid bus to try out how the prominent solution for traffic in the capital works. 2017, passengers can travel on the route free of charge. Nguyen Huu Tuyen, a BRT driver, said the bus runs on its own lanes, thus facing congestion on just two or three sections. The entire route takes up between 40 and 42 minutes and the passengers seem very pleased, he noted. According to schedule, the bus system is available 17 hours per day, from 5 am to 22 pm with a bus departing every 5, 10 and 15 minutes. The Hanoi BRT project started in 2013 at a cost of 53.6 million USD, financed through World Bank loans. many of them drove on lanes designated for rapid buses.